​​Frequently customers return to the farm to show off their new "family member" all grown up. We love those visits, they are the highlight of our days. Check out some of the comments from Returning Visitors to Bright Creek Kennel. 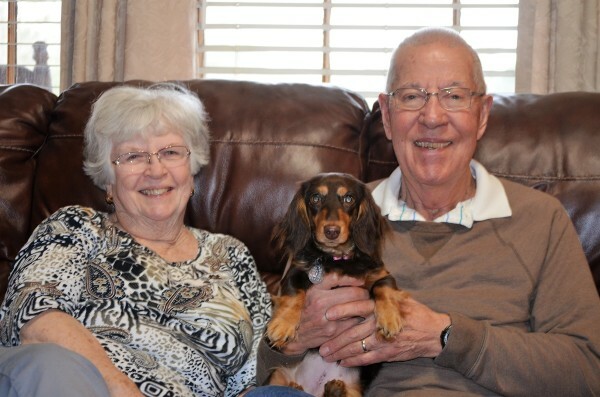 Danny and Deborah returned this week to place a new deposit and show off their spoiled girl "Daisy Mae". I wish I had taken a new picture to put up with the old one! She had grown into such a beautiful girl. Marge & R.L. bringing back their Greta for us to see! When Chad, Dana & Ali came to pick up Cooper, they decided on our adult Sugarfoot as well! Today is transistion day for Sugar. Cooper seems to approve! Sara was in town and stopped by to visit. She did not bring Oliver with her but told us all about him. She is getting married in June. Oliver approves! She held Swiss Miss, who kept coming back and begging to be picked up!